Packaging is a key process in the manufacture of almost every product. It touches virtually all industries and serves many purposes, including marketing, protection, and information transmission. Many of our customers sell production solutions for packaging. These system integrators use Visual Components to design and validate production solutions, sell their vision and capabilities, and present manufacturers with visual evidence that their solutions will work as designed. In most industries, integrators compete for packaging projects by offering competitive pricing and value. It’s a consultative sales process, and track record and reputation are certainly important, but price usually carries the most weight in a decision. It’s a different story in the pharmaceutical industry. There’s significant regulatory oversight, meaning it takes more time to design, validate, and commission new production plants. This means it takes longer for pharmaceutical companies to bring their products to market, which they don’t want. They value speed to market. So, when looking for suppliers to partner with on new plants, pharmaceutical companies will pay a premium for those that can deliver on time, rather than looking for a bargain price. These projects aren’t easy, and system integrators will certainly earn their pay. Pharmaceutical companies set aggressive and tightly coordinated schedules, with no room for error or miscalculations. These projects are very structured and intense, and customers expect their suppliers to deliver on time. So, how does Visual Components help system integrators competing for pharmaceutical projects? In short, our software helps you to design and validate production solutions, clearly communicate your offering to stakeholders, and secure customer confidence in your ability to deliver. 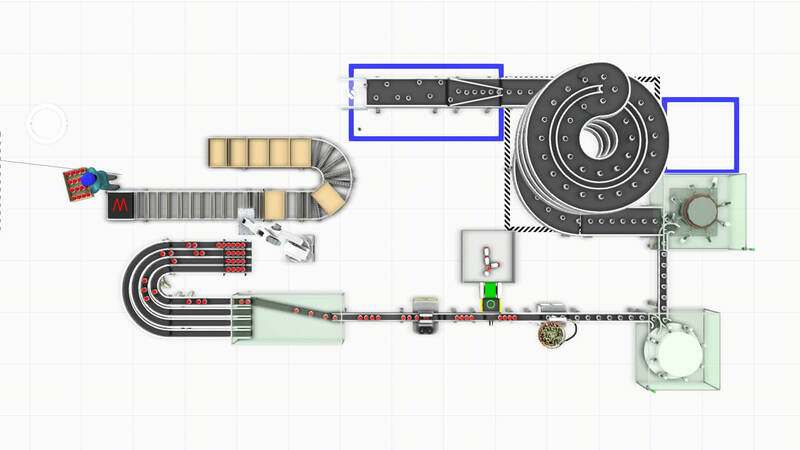 The core of Visual Components is designing and simulating production solutions. We make this task simple via an extensive library of ready-made components and simple workflows for creating and simulating layouts. 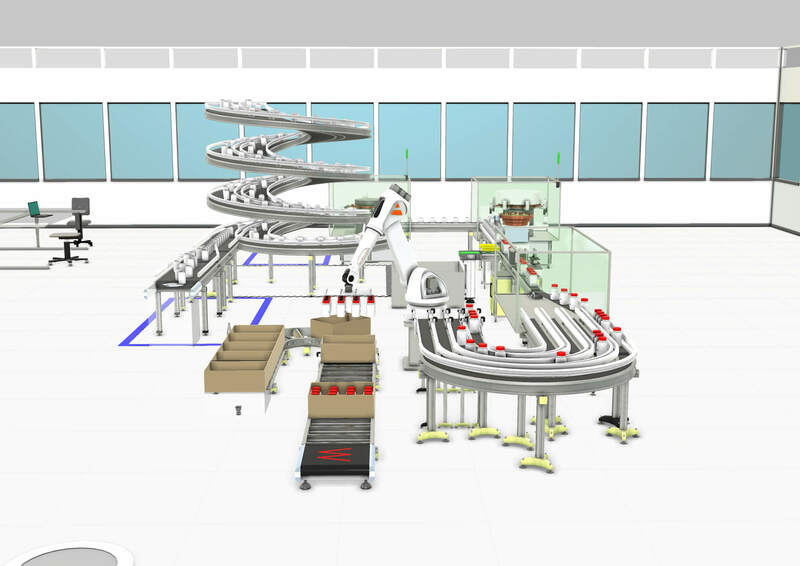 The Visual Components eCatalog, included in all Visual Components products, contains a library of 2,000+ components, including robots, conveyors, and other production equipment and fixtures. This gives our users a broad starting point for creating practical layouts for packaging production. As Visual Components natively supports most leading CAD file formats, it’s also easy to import your own CAD files directly into the software. Our software’s intuitive user interface and simple layout configuration workflows make it easy to create 3D layouts, ready for simulation. Simply drag and drop components from the eCatalog directly into the 3D world and connect compatible components using the plug-and-play feature. As the operating logic is integrated into the components, simulations are easy to run, and adjustments are easy to make. Designing and optimizing production solutions with Visual Components is fast, easy, and accurate. We’ve seen integrators use Visual Components to reduce their design time from days to hours. We know that creating the content for your proposal can be a time consuming task. But, it’s an essential part of the proposal workflow. Visual Components makes it easy to export presentation-ready content for your proposal – such as 2D drawings, interactive 3D PDFs, 4K videos and high-resolution images – directly from the software. With one click, you can create marketing grade content with engineering grade accuracy. And, with the new Visual Components Experience, you can export your simulations to run on our mobile and virtual reality applications. Take your prospects on a virtual tour of your proposal! Download samples of our project ready deliverables and see for yourself! 3D manufacturing simulation software can be a powerful tool for building credibility and eliminating knowledge gaps among stakeholders. This is especially critical when competing for pharmaceutical projects, where there are usually multiple stakeholders in the selection process, many without a manufacturing background. Communicating your work in a format that all of them understand, not just the technical audience, facilitates more efficient and productive discussions amongst all stakeholders, and helps you build buy-in for your offering. Want to find out how you can use Visual Components to accelerate your proposal workflow and win more projects in pharmaceutical packaging? Get in touch with us to schedule a personalized demo!